A complete denture (CD) is a type of removable prosthesis designed to replace all of the natural teeth in an arch and associated structures of the maxilla or mandible (fig. 8-8). However, a CD denture does not usually replace third molars. The CD consists of an acrylic base and porcelain or acrylic artificial teeth. The base is designed to fit over the alveolar ridge, and is composed of the saddle and gingival area. Sometimes, patients need a set of CDs; one for each arch. If a CD is constructed for insertion immediately following the surgical removal of all remaining teeth, it is considered an immediate complete denture. Before a conventional prosthesis is fabricated, the extraction sites must be completely healed. Therefore, immediate dentures are often considered temporary or interim prostheses. The immediate denture also functions as a psychological aid to the patient, who will never have to be completely without teeth. Immediate dentures usually require relines 3 to 12 months after initial insertion. This is because of the dramatic reduction in the ridge size during the healing process. Figure 8-8. - Maxillary and mandiburlar complete dentures (CDs). A removable partial denture (RPD) is a type of removable prosthesis designed to replace one or more missing natural teeth (but not all), gingival tissue, and associated parts of the maxilla or mandible. 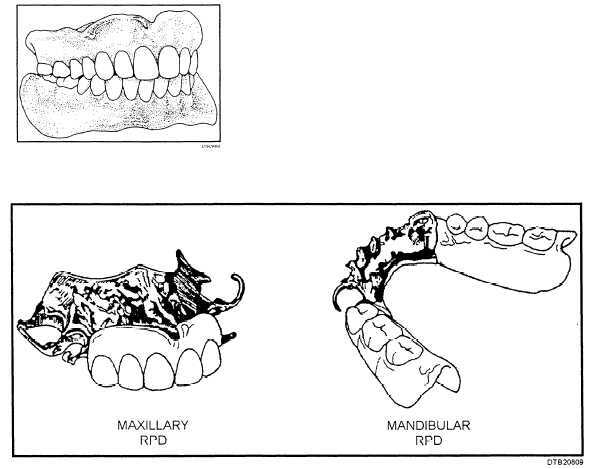 Figure 8-9 illustrates maxillary and mandibular RPDs. There are several RPD types, based on the materials used to construct the prosthesis. One type is a cast metal RPD. This prosthesis may have a cast metal framework with denture plastic and artificial teeth made of resin, ceramic, or metal attached. A cast metal RPD may also be constructed of all metal in which the entire RPD (frame, denture base, and teeth) are all made from cast metal. The dental laboratory will use a nickel chrome-alloy (ticonium metal) for RPD framework castings. Another type of RPD is the resin RPD made completely of acrylic resin. Sometimes, wrought wire clasps are added to the plastic body of a resin RPD to help retain it in the mouth. The resin RPD is often considered an interim RPD and is intended to be temporary in nature. Resin RPDs are used to replace a metal RPD that is broken, no longer fits, or may be prescribed to patients who lose any anterior teeth from an accident. Resin RPDs are a less expensive, and a temporary substitute for replacing missing natural teeth. Figure 8-9. - Maxillary and mandibular RPDs.